Find farmers’ reports on the effects they achieve with BONSILAGE SPEED here. Agrofarm Raguhn is situated in Bitterfeld-Wolfen (Saxony-Anhalt) and farms an area of 1,500 ha. In addition to around 400 dairy cattle and their followers, it keeps 150 fattening bulls. The average milk production is 9,500 kg, with the proportion of maize in the base feed at 60%. 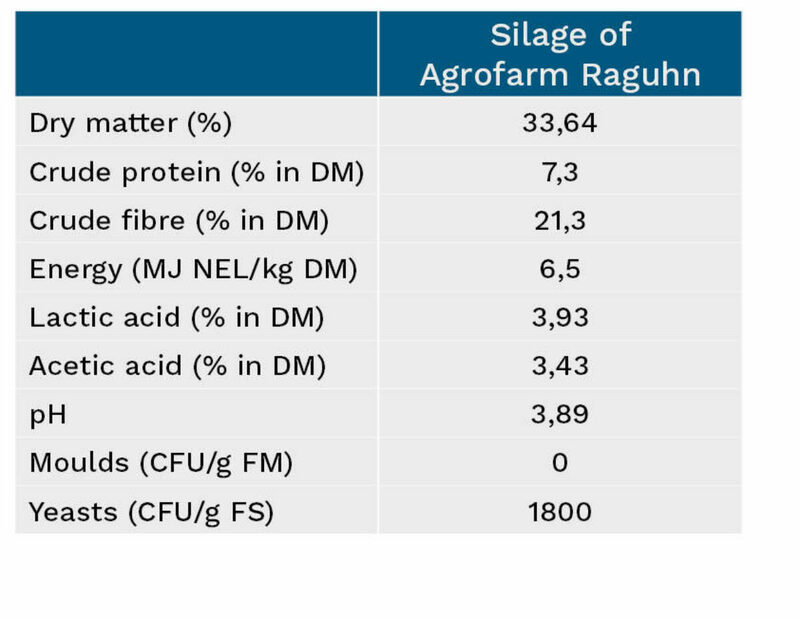 Agrofarm Raguhn takes its grass silages from 150 ha of grassland and 165 ha of ley. 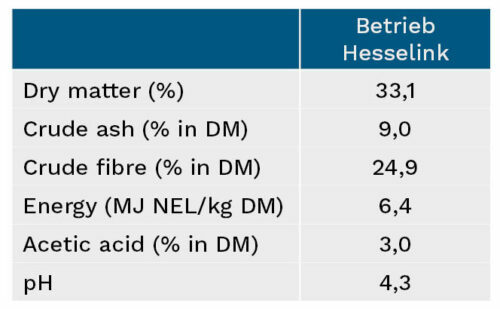 As the 2016 maize harvest was lower than expected, the animal production manageress Kirsten Hempel and the plant production manager Steffen Steiger, together with the SCHAUMANN consultant Gernot Elz, decided to use BONSILAGE SPEED M in 2017. Silaging is measurably faster with the ensiling agent and the silo ripening time is shortened to 14 days. Thus, the treated silage can already be fed after two weeks. The cut was stable and there was no reheating. 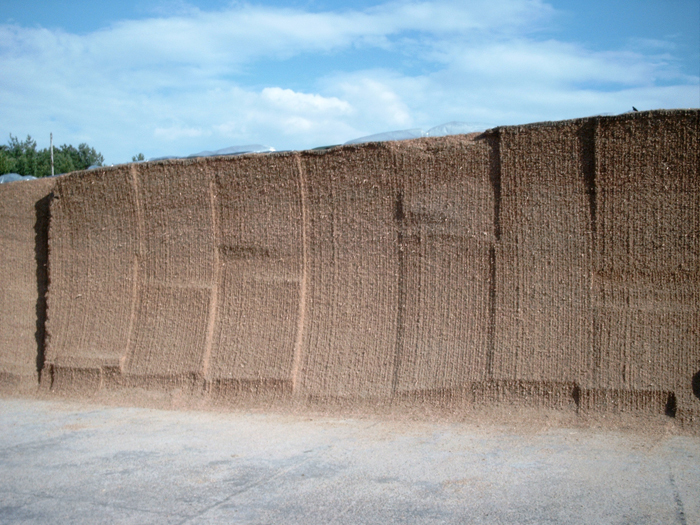 “We place emphasis on high-quality silages, which are aerobically stable. 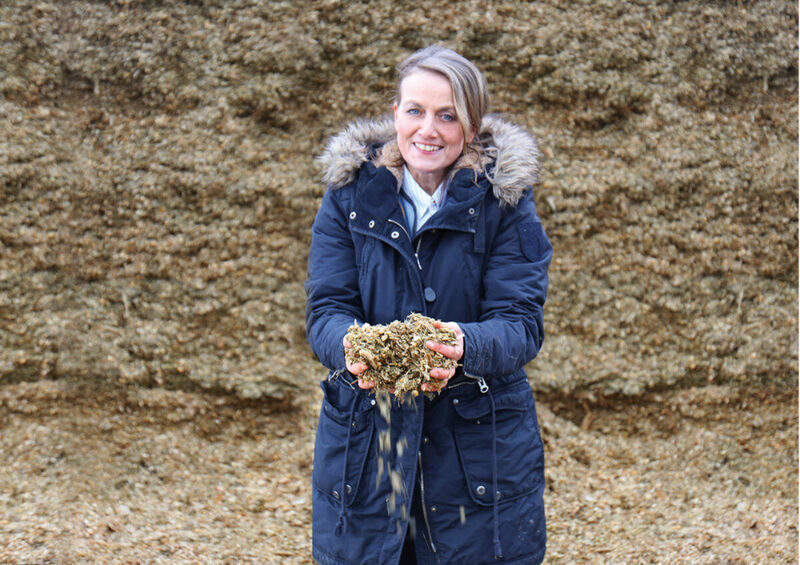 Only excellent feed quality guarantees high base feed intake”, Kirsten Hempel and Steffen Steiger are of the same opinion. 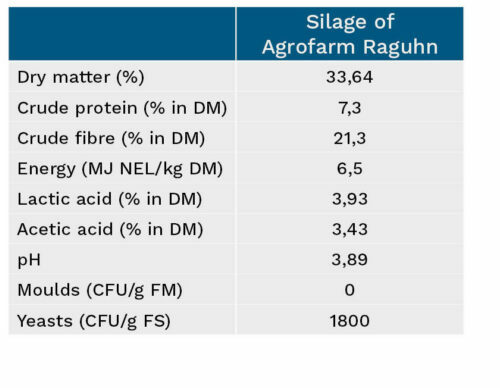 For this reason, Agrofarm Raguhn has already been using the BONSILAGE ensiling agent successfully with maize for many years. The agricultural business Spörrer-Hagn GbR can be found at 600 metres above sea level between the Fichtel Mountains and Steinwald. 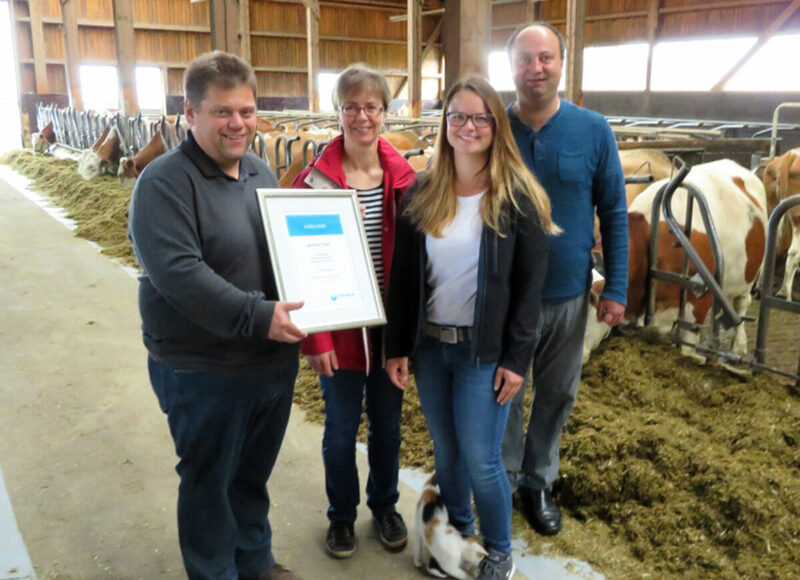 The dairy farm with 75 Fleckvieh cattle is run jointly by the siblings Josef Spörrer and Cornelia Hagn. The farm successor Barbara Hagn is responsible for feeding and herd management. The farm has done away with soy and has been feeding GMO-free for several years. 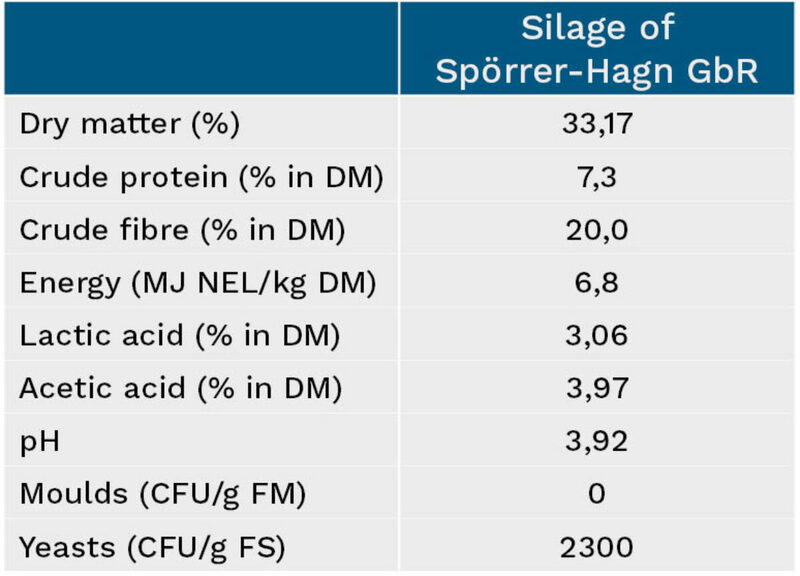 There is a high demand for the existing base feed components: “High and healthy milk yields are only possible with hygienically pristine silages”, explains Barbara Hagn. The Fleckvieh cows in the herd agree with her. The average milk production of over 9,500 kg milk in the course of a year confirms that they are on the right path. The base feed proportion in the partially mixed ration for the dairy cattle is 60 % grass silage and 40 % maize silage. “A faster silaging process, in which high-quality base feed is produced, is very important for us. Maximum base feed utilisation can only be realised in this way”, says the farm manager. 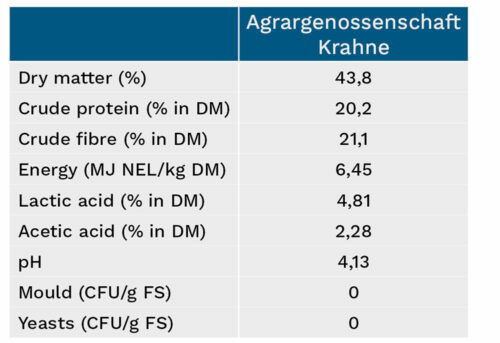 In 2017, the yields from the 15 ha maize crop area were treated completely with BONSILAGE SPEED M. “SCHAUMANN area manager Jürgen Busch recommended the ensiling agent as we often have to open the silage earlier. 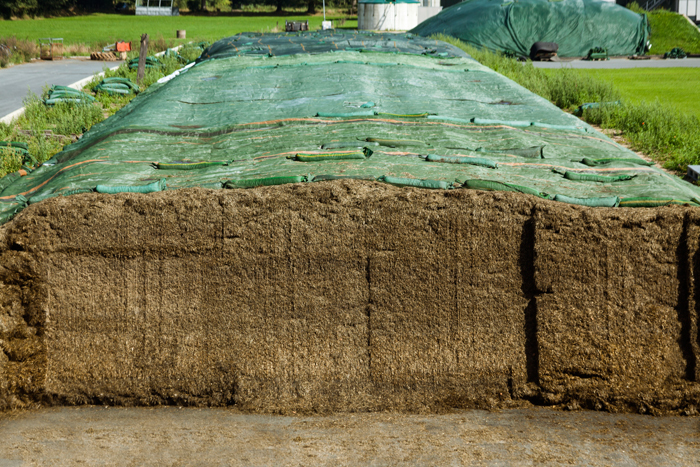 The result has convinced us: A stable, visibly easily digestible silage after a short ensiling period. Brothers Dieter and Michael Schumacher from Stemwede (North Rhine-Westphalia) manage a family business with about 60 dairy cows plus progeny. They also sell breeding stock and fatten pigs. They have milked their dairy cows in a new barn with milking robot since 2013. The annually adjusted herd performance is 12,200 kg milk per cow and year. For Michael Schumacher, high forage intake is decisive if the amounts of concentrate fed at the milking robot are to be kept within limits that are well tolerated by the cows. The business uses maize varieties with FAO numbers between 230 and 240, but prioritises high starch contents and good whole plant digestibility over mass yield per hectare. Dieter and Michael Schumacher have been using BONSILAGE silage additives since 2011 to produce palatable silages without reheating. “After we suffered considerable wind damage in our maize crops in the autumn of 2017, we decided that we would harvest the maize as early as in late September, two weeks earlier than originally planned. 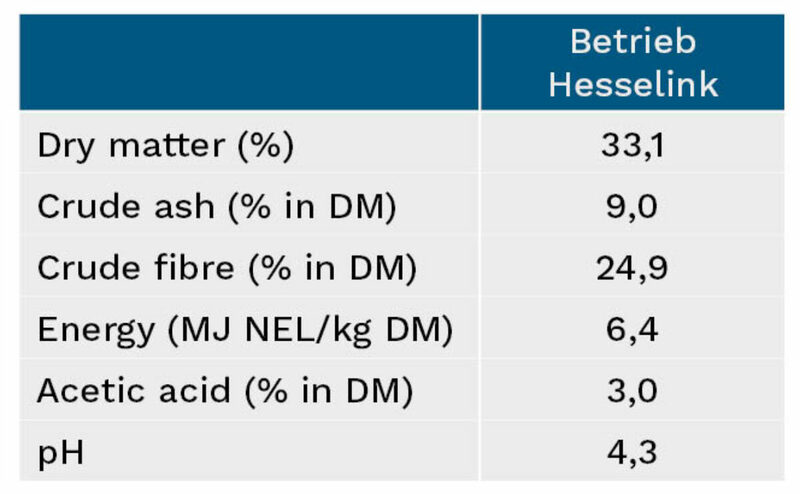 BONSILAGE SPEED M rapidly and reliably suppressed the proliferation of harmful bacteria, and we were therefore able to open our maize stack after only 14 days. The harvested silage could be fed to our animals without any spoilage”, says Michael Schumacher. 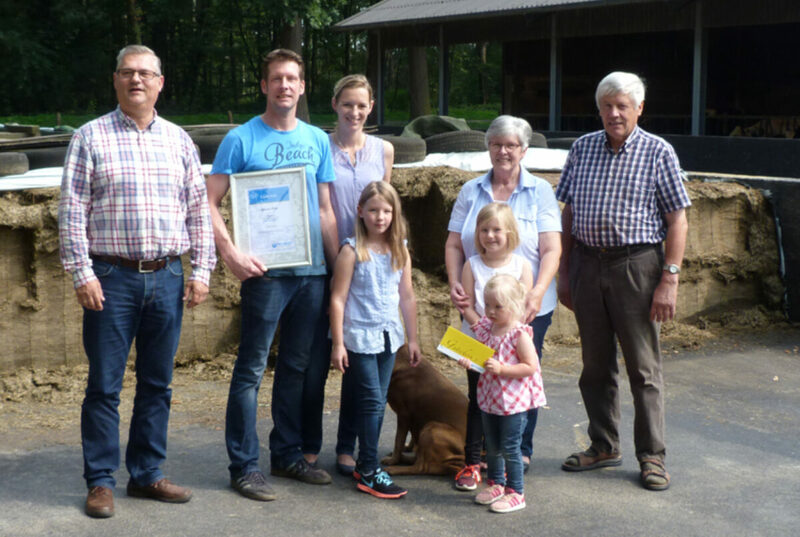 Heiner Hesselink’s farm in Ringe scored 160 out of a total of 200 possible points for its silage, making it the winner in the “subsequent cut” category. The farm’s average herd performance is over 10,000 kg milk. Its forage milk yield is over 4,500 kg milk, resulting in low concentrate requirements of less than 270 g/l milk. On the Hesselink farm, successful silage production forms the basis of high-performance, profitable milk production. One particularly important aspect is identifying the optimal harvesting time. The business has defined precise workflows for each step. At about 7.00 am, a contractor starts cutting the grass with an integrated tedder. Another tedder pass is made in the afternoon, if necessary when the grass dries slowly. The grass is swathed straight away in the afternoon, if dry matter contents permit. It is ensiled no later than 24 hours after the start of cutting. A wheel loader with 15 t ballast and a mounted silage spreader is used for silage compaction. The silage is covered on the same day it is brought in. “A trusting partnership with the contractor is an essential factor for success”, says Heiner Hesselink. His contractor’s employees need to take autonomous decisions in the harvesting and chopping process. Hesselink emphasises that “wheel loader operators should sometimes leave transport trailers standing a little longer if grass silage is delivered too rapidly”. 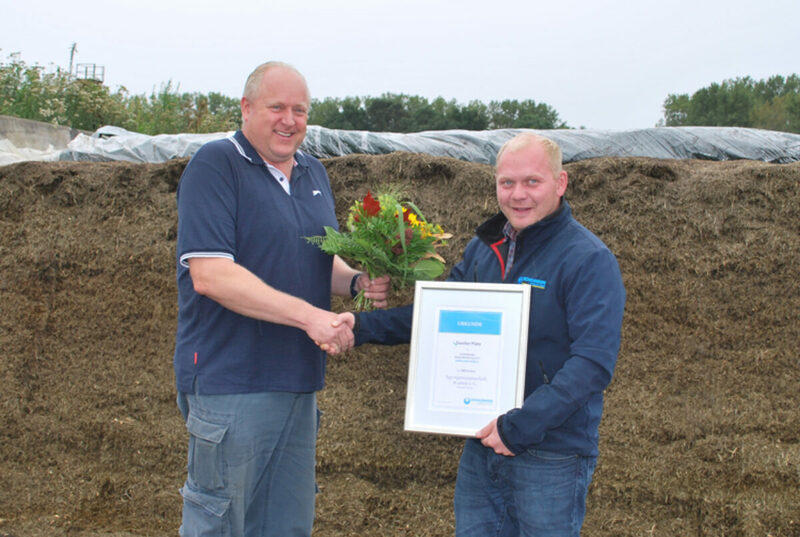 He selected the right BONSILAGE silage additive for his needs in consultation with his SCHAUMANN specialist consultant, Hendrik Cordes. 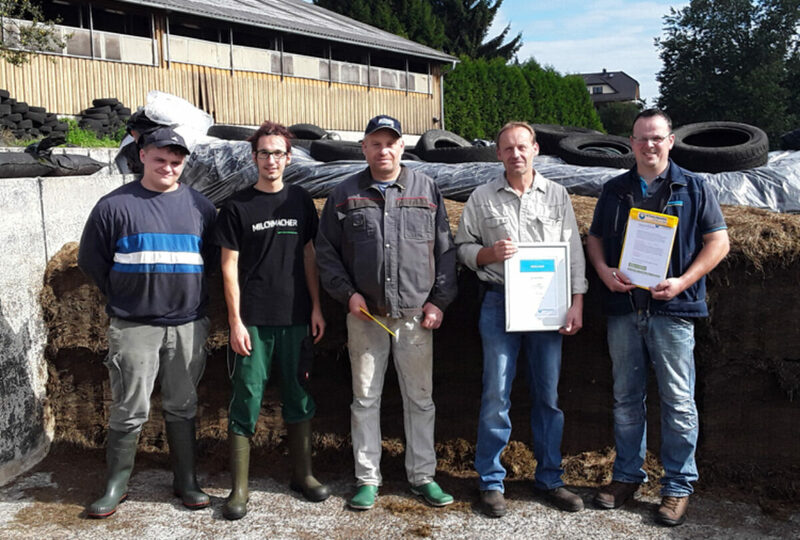 High silage quality, increased feed intakes and high silage stability within a short period of time are what farm manager Heiner Hesselink finds most impressive about BONSILAGE SPEED G. And his winning performance in the silage competition of the Chamber of Agriculture of Lower Saxony is proof that he has made the right choice. The location of the Agrargenossenschaft Krahne in Kloster Lehnin (Brandenburg) is characterised by light, sandy soils and low precipitation. Recurring droughts impair yields from their 900 hectares of permanent pasture. It is essential that feed for the Cooperative’s about 500 dairy cows, their progeny and 250 beef cattle is ensiled with as much stability as possible, as the Cooperative cannot accept expensive feed losses. In 2016, a year of relatively poor harvests, silos were emptied more rapidly than expected. The Cooperative consulted their SCHAUMANN specialist Franz Becker and decided to use BONSILAGE SPEED G to shorten ensiling periods and ensure high feed intakes among the Cooperative’s herd as quickly as possible. An average annual yield of just under 10,000 kg milk per cow is clear evidence of the success of this approach. 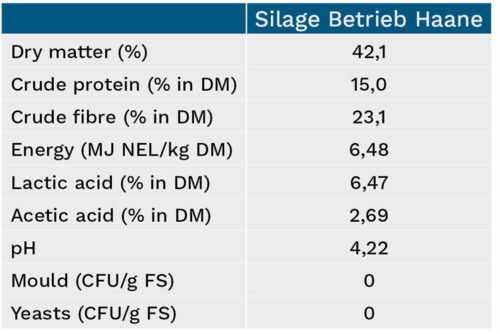 Once cows were fed silage treated with BONSILAGE SPEED G, Steffen Albert from the Agrargenossenschaft Krahne noticed that milk yields increased by about 1.5 litres per cow and day. “When we fed a different silage that had not been treated with BONSILAGE a little later, milk yields dropped again by 1.5 litres. 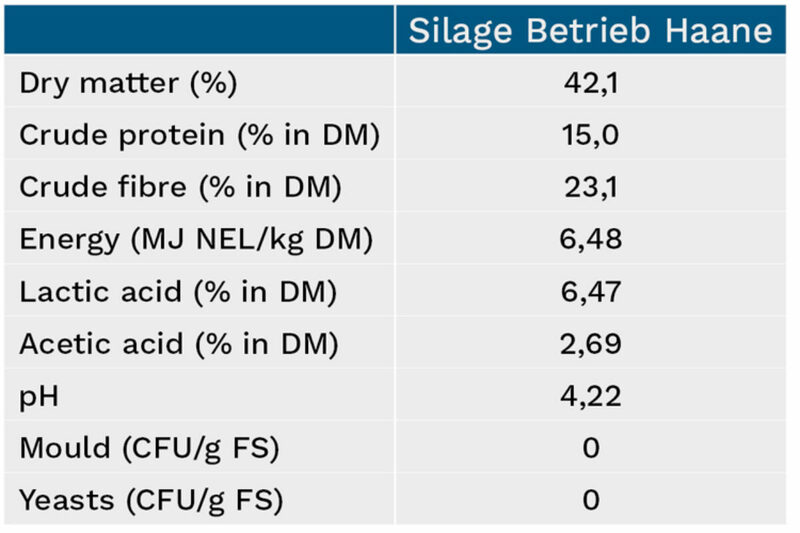 As soon as we switched back to grass silage ensiled with BONSILAGE, milk yields increased again by 1.5 litres, even though all of the silages fed came from the first cut and all other feed components remained the same, while only silage was changed”, Steffen Albert says. Hans-Jochen Haane from Dorsten/Lembeck in North Rhine-Westphalia manages a dairy farm with 140 cows and their progeny. An average annual milk yield of just under 11,500 kg with about 3.9% fat and 3.3% protein clearly illustrates just how important dairy production is for the farm. 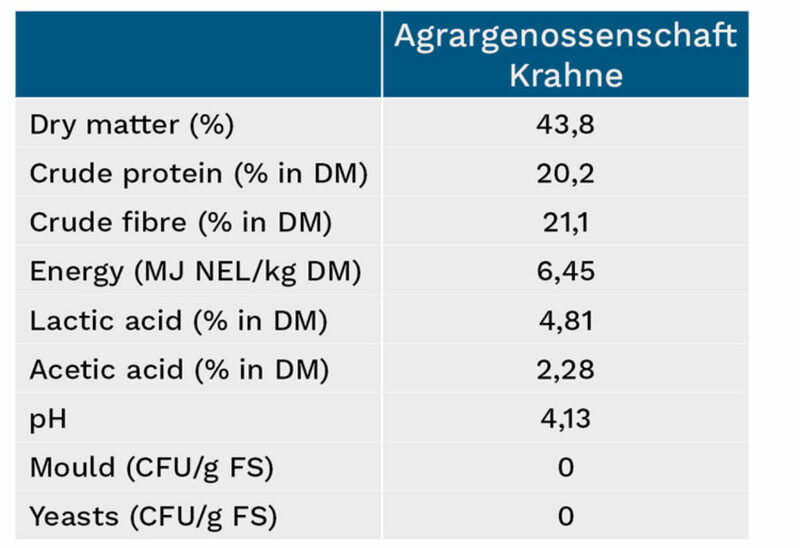 And Hans-Jochen Haane’s success confirms that he is on the right track: Despite an average daily production of over 35 kg milk per cow, the percentage of concentrate in improved partial TMRs never exceeds 35%. The production of high-quality, palatable forage is key for successful dairy production. Livestock feed rations are designed in cooperation with SCHAUMANN specialist consultant Wilfried Jenß, based on high-quality silage. For the Haane farm, which manages its pastures intensively, the ability to open grass silages quickly is the decisive criterion for choosing BONSILAGE SPEED G as their silage additive. The average yield per hectare of pasture is between 35 and 40 tons of fresh matter. Grasslands are harvested five to six times per year, depending on the weather. 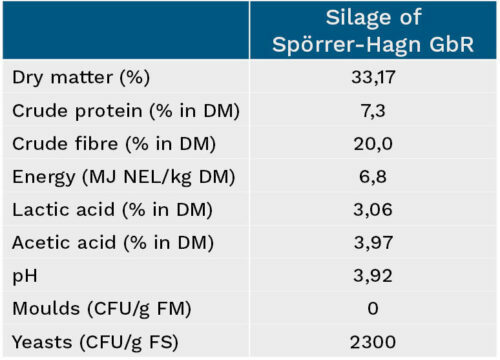 Good pasture management also plays an important role here: “It is essential to have high-quality grass growing on pastures so that it can be ensiled without losses using BONSILAGE SPEED G”, Hans-Jochen Haane says. He is very exacting when producing and harvesting staple feeds and treats all preserved feeds with BONSILAGE. As a farm manager, he is clear that “we cannot risk producing any waste”. Hans-Jochen Haane places particular emphasis on the correct cutting height during the harvest, as this ensures that clean forage is brought in. He never cuts any shorter than 8 cm, and he additionally makes sure that layers are deposited as thinly as possible and spread evenly using a silage spreader. With a payload of 17 tons, his roller tractor is dimensioned to easily compact the harvest volumes that are brought in. Christian and Joachim Engel are running their Mörschied (Rhineland-Palatinate) dairy farm with 115 cows, plus progeny, as a third-generation family business in the Hunsrück, a typical low mountain range region at altitudes above 400 m. Since this region is borderline suited for growing maize and maize yields therefore vary considerably, roughage planning mainly relies on natural pastures. 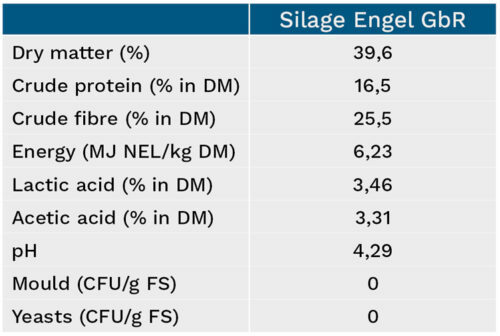 The Engel brothers value the fermentation quality of grass silages particularly highly, because it is key for achieving successful, high performance from staple feeds. The farm harvests a cut of forage about every four to five weeks on a yearly average. With about 10 tons of dry matter per hectare, its yields are well above average for the region. “Appropriate silage management is our core tool in feed production. Dirk Baumgart, our specialist SCHAUMANN consultant, supports us in selecting the right silage additive. Using the correct cutting height to avoid contamination and matching the speed of incoming forage deliveries to rolling speeds are just two of a number of important adjustments that can be made”, the Engel brothers say. 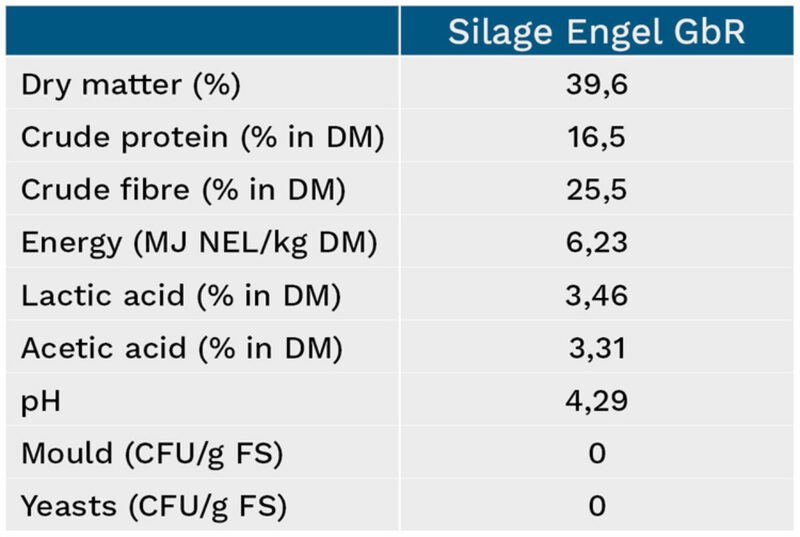 Engel GbR treats their grass silage with BONSILAGE SPEED G, and the product impresses with very high aerobic stability and optimal suppression of fermentation pests after even very short silage maturity. The above-average silage quality supports very high feed intakes of 20 to 21 kg per animal and day. The portion of purchased concentrate on the farm is 35% of dry matter intake to provide feed rations that are optimised for high-performance ruminants. This is reflected in the cows’ average annual yields of more than 10,000 kg milk with 4.1% fat and 3.35% protein.